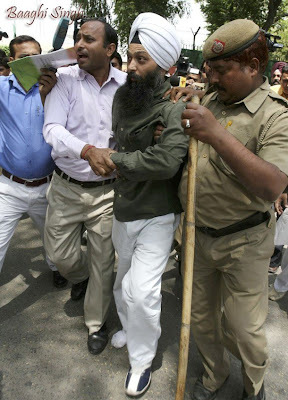 THE ROAD TO KHALISTAN: Hurray For Jarnail Singh of Delhi! Hurray For Jarnail Singh of Delhi! Occasionally, my inbox holds a delightful surprise. This morning when I logged on, I glanced through my e-mail and an item "Sikh Journalist Throws Show At Home Minister" immediately caught my attention. I opened it immediately, abandoning my usual methodical way of dealing with e-mail. I was not disappointed. It seems one Jarnail (nice name!) Singh, a journalist from Delhi, had had enough of Mr. Chidambaram's cavalier attitude about the phony clearing of tytler and lobbed a shoe at the Home Minister. No charges were filed against Mr. Singh since Chidambaram has "forgiven" him. Might it also have something to do with the upcoming elections? A perfect gesture, insolent, cheeky, insulting, yet no physical damage. This is what we used to call"insulting with style." There is, however, a saying "Never insult with style when you can insult with substance." The next act may well have some substance. I just read that Congress may withdraw the candinancy of noth Jagdish and Sajjan Kumar. A victory, however small is still a victory. Shall we all sing together? Carry on, carry it on. Carry it on, carry it on. By the way, I also see in my inbox that the three year sentence of the original shoe thrower from Iraq has been reduced from three years to one. That's better, but still, they ought to give him a medal and a lifetime pension for shucking his shoe at Bush.